"This rub is so simple! It's made with the everyday spices you have in your cupboard. I rub it on everything from chicken to pork to burgers to steak. I keep it in a Ziploc® bag in the freezer. It's always ready to go! Double or triple your ingredients so you always have it on hand." Mix brown sugar, paprika, black pepper, salt, chili powder, garlic powder, onion powder, and cayenne pepper in a bowl. Store in an air-tight container or keep in the freezer in a sealable plastic bag. I used this on a chicken and the coating fell flat in my opinion. I do plan to try this rub on rib eye in the near future. Fabulous! Love the combo of smoky paprika and brown sugar! Very good! This recipe will definitely be used again! I rubbed it on chicken leg quarters and let it sit in the fridge all day, then my hubby grilled it to absolute perfection! YUM!!! 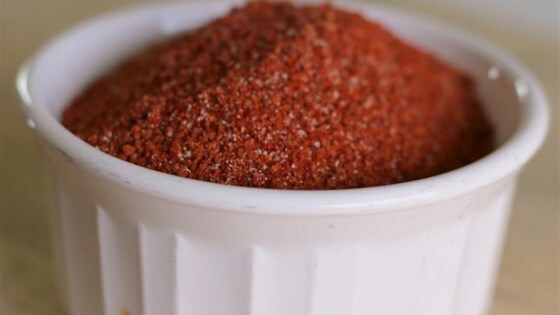 Great, classic and simple rub recipe! I usually do a rub just like this, but I add just a tad of cumin. A little cumin goes a long way in adding that little bit of extra flavor.